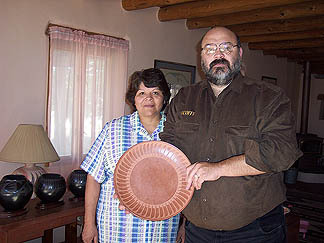 Sandra shown here with one of her large feathered plates (not fired), continuing the strong tradition of her Grand Ant, Maria Martinez. Sandra Chaparro has a very unique ancestral tree. She is the granddaughter of Desideria Montoya who was the sister of Maria Martinez. And she's also the granddaughter of Isabel Montoya who was a cousin of Maria's. So Sandra is driven by two strong size of her family tree. 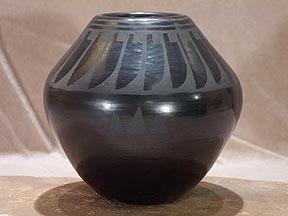 Currently Sandra is working with a black on black pottery as well as white on red. She is very much driven to continue in the tradition of her family and it shows in her excellent work. 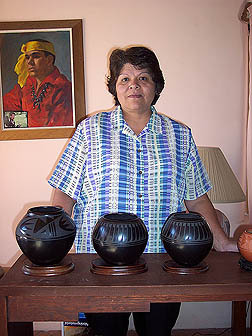 One of the very fortunate areas of her work is in the pottery plates. She is one of the few ancestors who is continuing the tradition of the wonderful plates of San Ildefonso. Perhaps it's the fact the plates are very difficult to make is why few others are continuing this tradition.